It was only an exterior launch, not the actual car, but what he saw left Rediff.com's Rajesh Karkera hugely impressed. 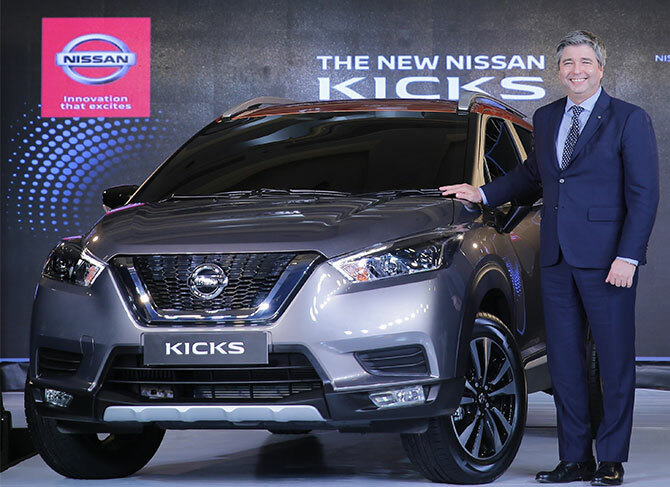 As the new trend of unveiling cars goes, Nissan too has joined the bandwagon and unveiled their upcoming SUV, The New Kicks, in India. 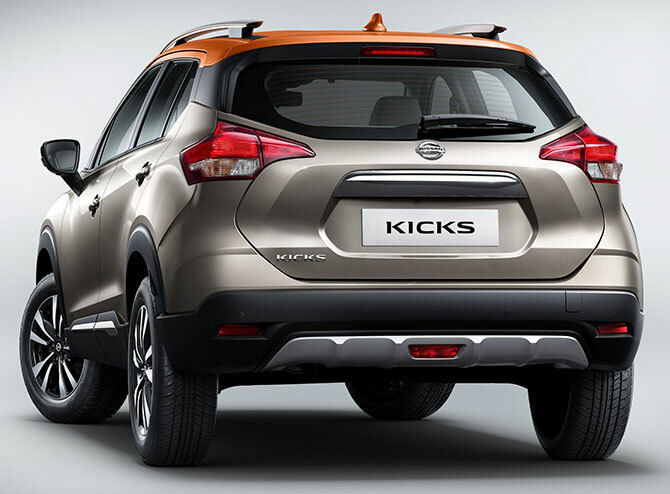 Visually the Kicks sports a wider and more robust look than its earlier avatar which is available in the global market. The launch strangely was just to showcase the exterior of the vehicle. Which does look quite big when compared to other cars in the segment, like the Hyundai Creta. But one can't overlook the fact that at a glance you just might mistake it for a slightly bigger Terrano. Maybe it’s the consistent V-motion grille, which is a signature motif in Nissan’s design language. 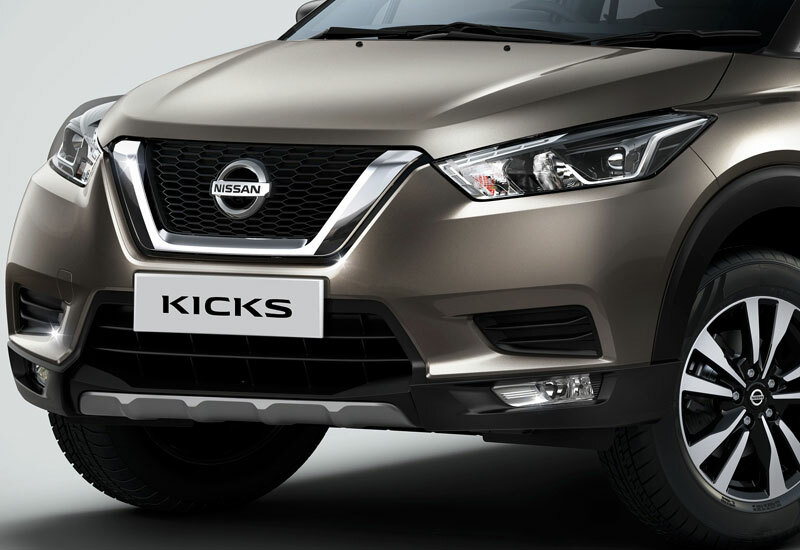 Globally the Nissan Kicks is a much smaller car and is based on the Micra platform, but the Indian version seems bigger and shares the same platform as the Nissan Terrano, the Renault Duster and Captur. The company says that the body is designed and built with GRAPHENE (Gravity-philic Energy Absorption) body structure, which has inherent capability to absorb impacts, making the Kicks stronger, safer and durable on Indian roads. What we see is a floating roof design created by blacked out C pillars and a pair of stylish roof rails. The headlights are projector headlamps with LED DRLs. The roof also sports a shark fin antenna. The front fog lamps seem to be lower on the front bumper and focused directly on to the road ahead and door mounted ORVMs with Indicators can be seen on the display vehicle. 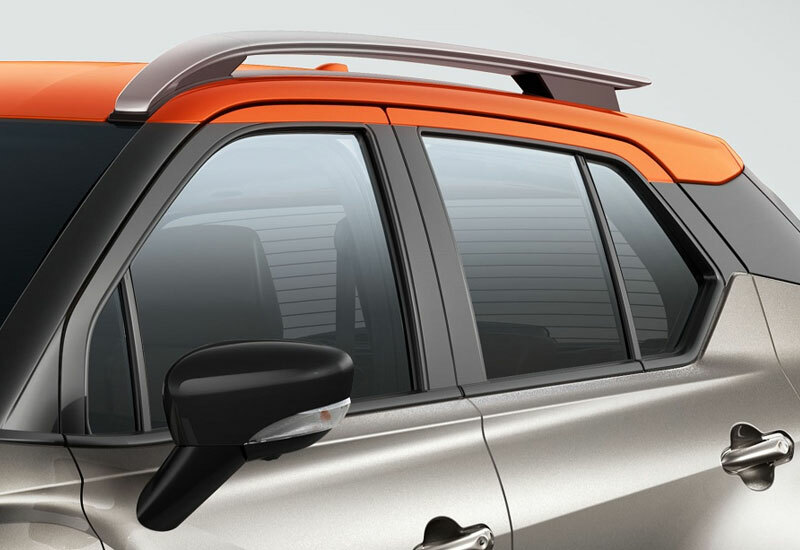 The Floating orange roof created by blacked out C pillars and a pair of stylish roof fails. Don't miss the bulge of the 360-degree camera under the ORVM. Another interesting feature are 360-degree birds eye cameras which are fitted under the ORVMs. There are three cameras which could be seen. One in front, in the Nissan logo, and two under the ORVMs. This will probably be a first in India. The global model launched in Dubai earlier, which is a smaller version of the new Kicks, has these cameras which give you a virtual 360-degree bird’s-eye view of your vehicle all the time when you are sitting inside, on your infotainment screen. Looking at the cameras on the Indian version, it looks like it will be the same here too. Maybe this is an important aspect of Nissan's new intelligent mobility solutions. The bumper cladding houses the fog lamps and the projector headlamps, and the DRLs look quite refreshing. The 17-inch diamond cut alloys are striking. The dimensions of the Indian version are 4384 mm in length, 1813 mm in width, and 1656 mm in height. The SUV will come with a wheelbase of 2673 mm and the ground clearance seems to be more than 200 mm. And last but not the least. The tyres are a whopping 17 inch 5 spoke alloy, which surely will enhance its looks on our roads. The car will be launched in early 2019, January perhaps, when it will take on the Tata Harrier which will also see a launch around the same time.